There may be some differences in this Lord’s Prayer than what you are accustomed to, therefore make changes as you see fit. After you have given the directions for the craft and while the students are working, sing the Lord’s Prayer responsively or have your students repeat the prayer as you say it. This, especially singing, works well for a memory lesson, otherwise known as a mnemonic technique. 1. Prepare and cut strips ahead of time for the cross on the banner. For each banner, cut a 1 inch wide by 7 inch long strip and a 1 inch wide by 10 inch long strip. 2. Place the child’s hand, with the fingers together, on the white construction paper. Draw around the child’s hand. Have the child cut the shape out. This is a wonderful small motor skill task and is very good for developing cutting and hand/eye coordination skills. Don’t let the student become frustrated. If they need help, place your hand over their’s and guide them. 3. Make a copy of the Lord’s Prayer. It will need to fit inside the shape of the child’s hand, so reduce and adjust before printing. Cut out the shape of the prayer. 4. Place the blue construction paper on your art table with the short ends at the top and bottom. Glue the longest yellow strip, vertically, down the center of the construction paper. Position and glue the shorter yellow strip across the first to form a cross. 5. Glue the hand shape at an angle over the lower half of the cross. Glue the copy of the prayer inside the shape of the hand. 6. Randomly draw swirls, shapes and lines, with the glue stick, over the surface of the banner and sprinkle on glitter. 7. Place dots one inch from the top and one inch from each side of the banner. Place two more dots one inch from the top and three inches from each side of the banner. Paper punch each of the four dots. Starting from the front, thread the wood skewer through the holes for the hangers. 8. Cut an 18 inch length of yarn. Tie an end of the yarn to each end of the wood skewer for hanging. Explain that It is the model for all prayers. The Lord’s Prayer teaches us that we are all God’s children and He is the Father. Anytime is a good time to pray. 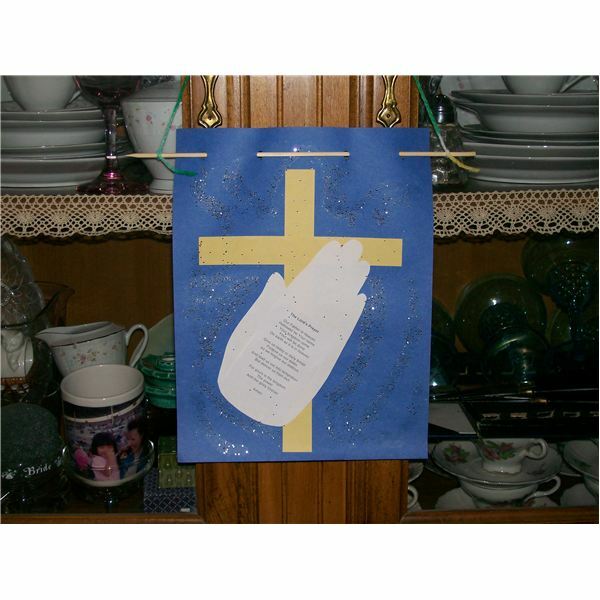 Your students will be so proud to take this banner home for their rooms and they will enjoy using it as a way to remind their family to pray. Their cutting skills may not be perfect, but to the child and his or her parents, it is. Leave out the scraps of leftover paper for more practice time and they will continue to improve.